Today we’re examining one of the most famous print ad campaigns of all time. The Volkswagen “Think Small” campaign. How did a funny looking car that was named after a bug, known for being slow and manufactured in factories built by Nazis ever become iconic to a generation of post-war Americans? Great design and fantastic marketing. Cars were fashion statements, testosterone boosters, muscles on wheels. 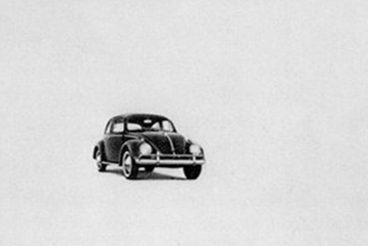 As the 1950s came to a close, Doyle Dane Bernbach (DDB) and Volkswagen decided to completely destroy the status quo for automobile ads with the “Think Small” campaign. The 50s and 60s were a time when cars weren’t just a way to get the kids to school. Cars were fashion statements, testosterone boosters, muscles on wheels. They were built to be fast, big, stylish and the ultimate way to earn bragging points. Think of the amazing challenge here for any marketing company that would take on this client. The Volkswagen Beetle was a small, slow, ugly, foreign car that the folks at DDB turned into an iconic piece of American pride. Keep in mind, this wasn’t just any foreign car either. This was a post-WWII German car, “the people’s car,” a Nazi car whose development was tied to Adolf Hitler himself. If you asked me to sell this vehicle to a country still bitter about a war that threatened their most core ideals, I would’ve thought you were nuts. How in the world did they pull it off? The answer is mind-bogglingly amazing from a marketing perspective: they were honest, boldly so. To see what I mean, consider the copy in the ad below (click for larger version). This ad starts off doing the exact opposite of what you would expect in a car ad. It launches into a discussion about how slow Volkswagens are! It talks about how cool and streamlined fastback cars are and how the Volkswagen won’t even go over 72mph. What the heck? If you woke up to find this ad in your newspaper in the 1960s, you were thoroughly confused and just had to read it. At this point, they’ve already won. They’ve sucked you in with clever copy that seems to actually insult their product. What’s the angle here? So you can easily break almost any speed low in the country in a VW. And you can also cruise right past gas stations, repair shops and tire stores. The VW engine may not be the fastest, but it’s among the most advanced. See what they did there? It’s a classic straw man situation. They set up this ideal car and told you why the VW wasn’t anything like it, then they bashed in the straw man by telling you how this was a good thing. The VW isn’t fast, so it doesn’t guzzle gas, burn through tires or need frequent repairs. Wait, that sounds pretty nice actually. It’s not fast, it’s smart. That was something average, every day Joes could identify with and even find desirable. Also note how the car is discussed in the ads. It’s frequently referred to as a “VW” instead of a Volkswagen. Volkswagen is a mouthful that doesn’t remotely sound American. VW is cool, fresh, simple and friendly. They planted this thought in your head without you even realizing it! You just went from wondering if it was socially acceptable to even own such a vehicle to having a cute nickname for it. In less than a minute, you just went from wondering if it was socially acceptable to even own such a vehicle to having a cute nickname for it. I do love a good sleight of hand, and this one is masterful. The marketing copy for the “Think Small” campaign was pure genius and is definitely what makes this one of my favorite campaigns of all time. The genius doesn’t stop there though. To highlight and reinforce this message, the graphics had to be stellar. The answer? Whitespace and lots of it. This isn’t a “lifestyle” ad. The car isn’t depicted as an integral piece of the daily lives of a smiling, middle class family. It’s a black dot on a sea of white. Tied together with the headline, “Think Small,” this was paradoxically an understatement that was somehow bold and shocking. Maybe owning a small car was a good thing after all. Heck, maybe it was even a great thing. On an empty background, your eyes are forced to take in the car. This tricks you into seeing the vehicle in a new light; the way the designers saw it. Not as an ugly foreign car in a sea of American beauties but as a uniquely attractive design statement oozing with personality. The ad copy may have appealed to the family man, but the high fashion, personality-driven visuals in this campaign would lead the Volkswagen on to become a favorite among teenagers looking to make a statement. The two ads above take us through the early to mid sixties, let’s fast forward another decade and see how Volkswagen was marketing their vehicles in the 70s. Look familiar? Three quarters of the ad is dedicated to a large image with the bottom quarter getting a headline and three columns of type. The format obviously held up quite well over time! But something has changed. We’re not selling a small car any more. Volkswagen isn’t thinking small, they’re obviously thinking big! How they’re selling it is the same old story though: economy. The Volkswagen Wagon is the smart choice. It has all of the benefits of a wagon and a van wrapped into one amazingly fuel efficient vehicle with comfortable seating for seven. Helmut Krone, Julian Koenig, William Bernbach, these names should mean something to you. If you don’t know who they are, find out. Can you be a good designer without this knowledge? Absolutely. But you simply can’t put a value on perspective. Knowing where your profession came from, as well as what not only worked in the past but also stood the test of time, brings an appreciation and understanding that changes how your mind works when you sit at that desk. You’re not just a designer. You’re part of an ongoing legacy. These people were selling funny cars, why would anyone care who they were or what they were doing? Yet here we are, fifty-three years later, examining their genius under a microscope. I implore you, value the work that you do. Put so much thought and effort into it that people will still care in fifty years. Tell Us Your Favorite Print Campaign! I could talk about the Volkswagen “Think Small” campaign all day. It’s such an amazing example of how designers and marketers can influence the minds of an entire generation. Good design changes the world and I simply can’t get enough of it. Now that you’ve seen my favorite print ads, tell me about yours. Which campaign would you like me to write about next?